The Tax Cuts and Jobs Act not only achieved great things for the American economy, but the landmark bill also zeroed out ObamaCare’s individual mandate effective January 1, 2019. The individual mandate was a centerpiece of the so-called “Affordable Care Act.” If an individual is not enrolled a government-approved health insurance plan, he or she would have to pay a punitive tax of 2.5 percent of his or her income or $695, whichever is greater. FreedomWorks pushed for the inclusion of including action on the individual mandate in the Tax Cuts and Jobs Act because, although Republicans failed to keep their promise to repeal the law, it would show progress on chipping away at ObamaCare. Another reason we supported including action on the mandate is that the Congressional Budget Office (CBO) always overestimated the coercive power of the mandate, which is why ObamaCare enrollments never came close to meeting projections, and would score as pay-for to go bigger on the tax cuts. The CBO estimated that zeroing out or repealing the individual mandate would save $338 billion over ten years. Finally, the primary reason FreedomWorks supported action to zero out the individual mandate was that it was a regressive tax. As we noted when the Tax Cuts and Jobs Act was being considered, nearly 80 percent of Amerian households subject the individual mandate earned less than $50,000 annually. New Internal Revenue Service (IRS) data compiled by Sen. Steve Daines (R-Mont.) reiterates that the individual mandate predominately hit lower- and middle-class income earners. 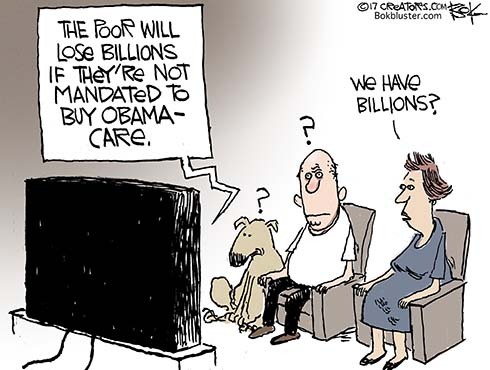 In 2016, roughly 77 percent of those who were subject to the individual mandate earned $50,000 or less. Maryland and Ohio had the highest percentage of payers who earned $50,000 or less, at roughly 85 percent each. Alaska, California, and Wyoming had the lowest percentage, at roughly 68 percent or lower. Overall, more than 4.9 million people were subject to the individual mandate in 2016, paying more than $3.6 billion. Around 33 percent of these payers earned $25,000 or less. Between 2014, when the individual mandate took effect, and 2016, almost 20 million people have been subject to the tax, paying nearly $8.4 billion simply because they either didn’t purchase a health insurance plan, the cost of which increased dramatically on the individual market because of ObamaCare coverage and actuarial requirements, or they didn’t have a government-approved health insurance plan. More than 80 percent earned $50,000 or less. Sen. Daines introduced an amendment to the Tax Cuts and Jobs Act that would have reimbursed those who had been subject to the individual mandate. Unfortunately, the amendment didn’t get a floor vote. The silver lining of the zeroing out of the individual mandate in the Tax Cuts and Jobs Act, though, is that a $43 billion tax -- essentially a poverty tax -- has been thrown into the dustbin of history. Hearts card game are really the challenging game that the kids loves to play online if you were interested in playing hearts then from our website https://heartsgameonline.net you will play the hearts game without any pay and app installation.